Many (many, many) moons ago I took my very first bite of a sushi roll. I was intrigued by this handheld snack and instantly fell in love with the little parcels of rice and teriyaki chicken, cucumber and avocado wrapped in nori sheets, doused in wasabi and soy and a slither of lurid pink pickled ginger on the side. Yes, back in those days, and I am talking a good couple of decades ago, chicken teriyaki was one of the first sushi rolls to pass my lips. 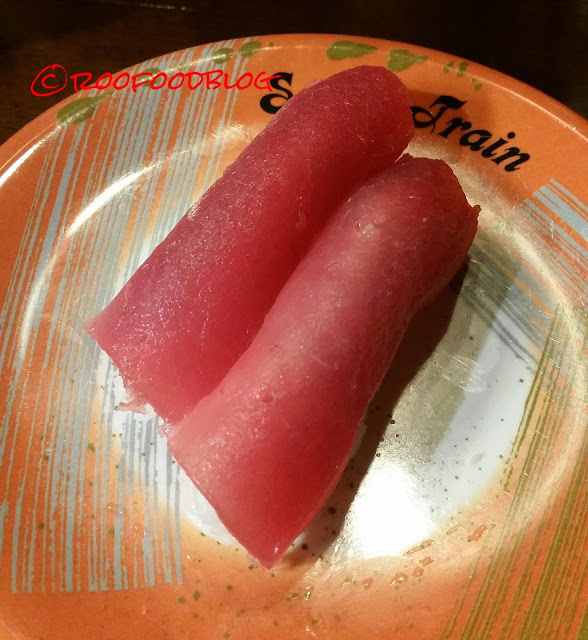 Thankfully, it wasn’t long before I was eating raw tuna and salmon rolls and moving onto sashimi, amongst other tasty morsels. My palate has certainly come an extremely long way since those days of chicken teriyaki rolls. I am by far no sushi expert. Yes I have had my fair share of sushi and sashimi. I have had varying degrees of quality and quantity both here in Australia and internationally. Of course, like most, I have my favourite(s). As with many ‘franchised’ restaurants I admittedly (and most ashamedly) have always had this pre-conceived notion that Sushi Train (which is also one of the originals to open in Australia) was a simple, casual sushi train serving plates of average sushi on mass to the public. 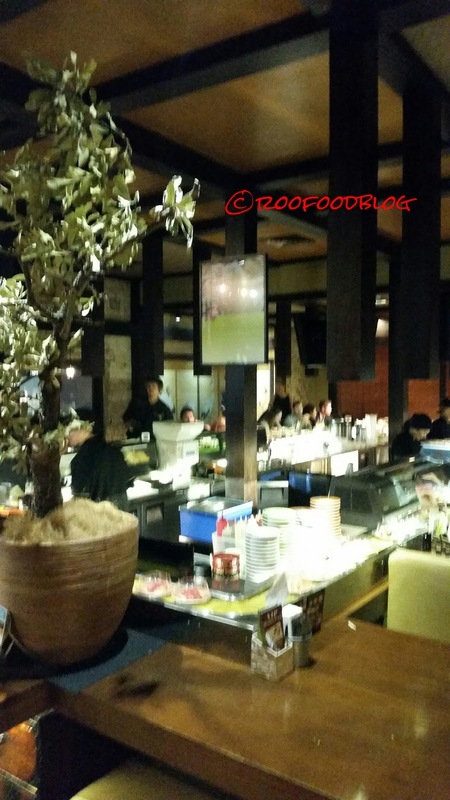 We arrived at Sushi Train in Neutral Bay at 6.30pm on a Tuesday night and the restaurant was bustling. I was blown away about how inviting and warm the restaurant felt. Friendly staff welcomed us into the restaurant and seated us at a booth near the rear or the restaurant offering us a full view of the room. The room has warm and friendly, with dark panelling, soft lighting, counter seating and booths which are beautifully set around a central preparation/kitchen area where you can watch the chefs. 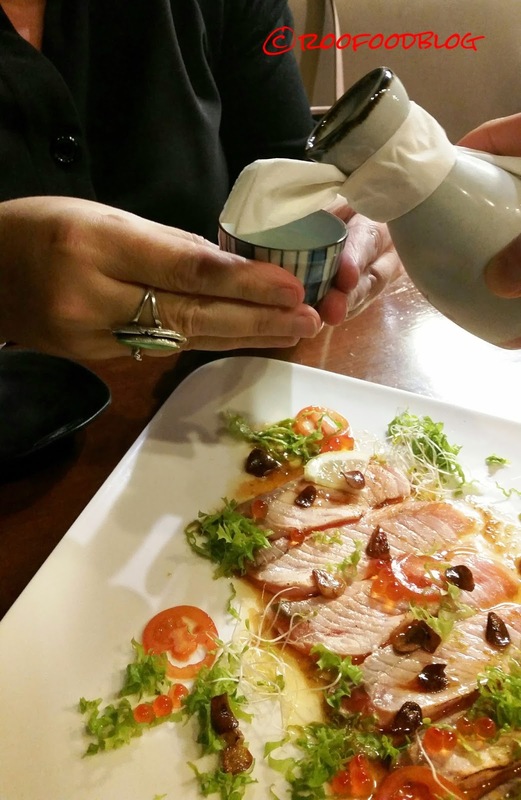 Ken, chef and owner introduces himself and has carefully prepared a dish of salmon aburi to start our meal. 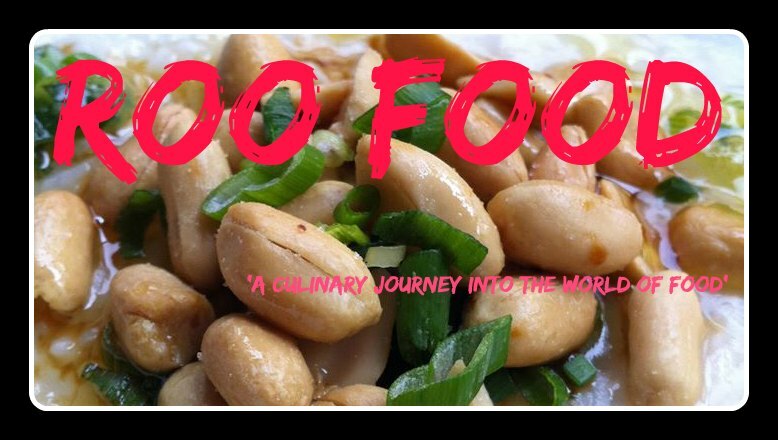 This dish is off menu and has been specially prepared for us. 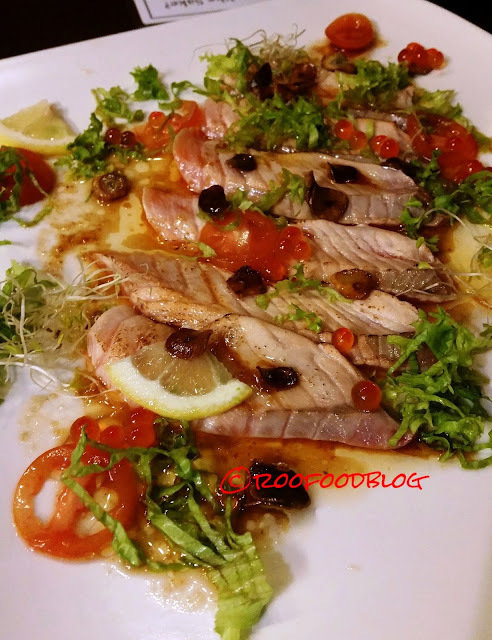 Salmon aburi is cross between half grilled and half raw. Usually found atop nigiri, this is ‘deconstructed’ with lettuce, tomato, alfalfa sprouts, lemon slices, fried garlic and salmon roe. This is a lovely light dish and I love how the fat pearls of salmon roe ‘pop’ in the mouth with a subtle fishy brine flavour. Sushi Train drinks menu includes a selection of good wines along with a small selection of sake. It's also noted that BYO is available. 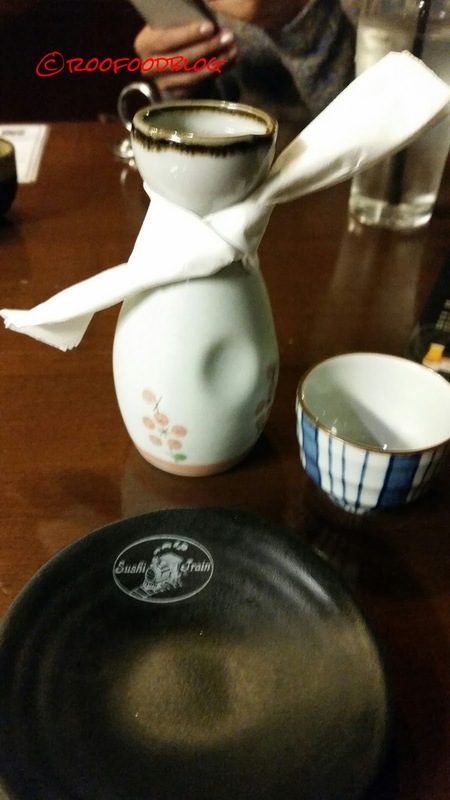 It doesn't matter how many times I have tried, Sake is unfortunately one drink that I have never quiet enjoyed. However, when Ippin is recommended, to be served cold, I decide on one last ditch effort The Ippin is described as medium body rich taste. We have also ordered the Bishonen, that has a dry and sharp finish (for comparison and research purposes). 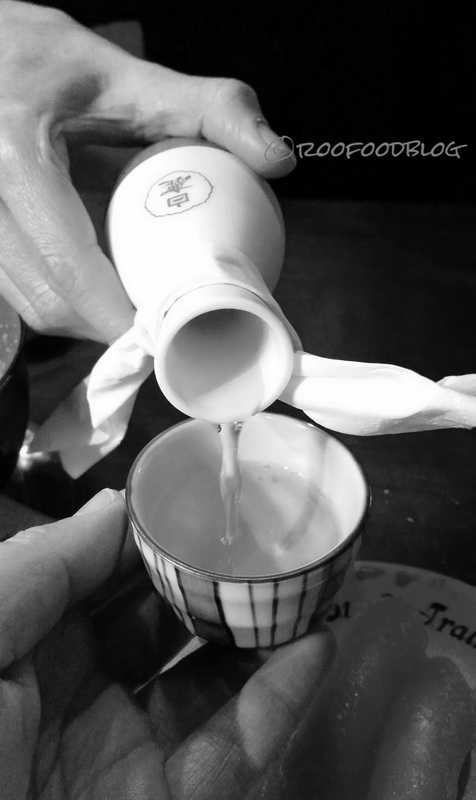 As a side note, if you are a member of Washuko Lovers, bring your card along and you will receive a complimentary sake. If you aren't a member head on over and join up (it's free). It is Japanese custom to pour drinks for others and never your own and a sure fire way to drink far to much. Although the Bishonen was exactly how I imagined it would be and one I am not partial to, the Ippin is a game changer! I really enjoyed this (but it must be cold). Getting down to the food. 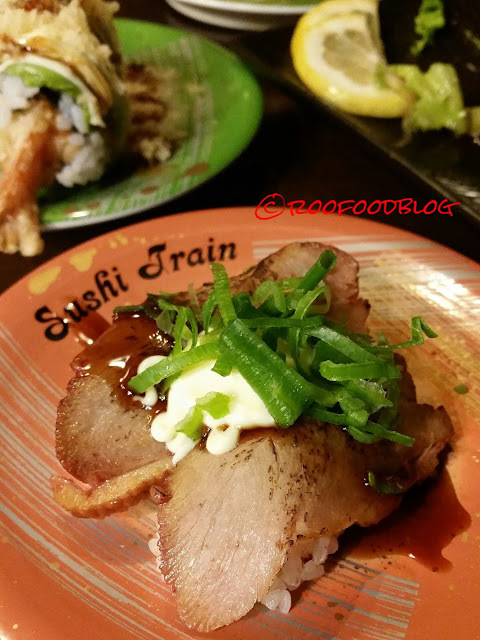 Sushi Train offers a more diverse and certainly more modern sushi compared to other restaurants. Sure there is plump and filling sushi and sashimi making it’s way around on the conveyor however, the menu offers an a la carte offering of nigiri, handrolls, ‘ships‘ reminiscent of an Izakaya vibe. It's refreshing to see something a little different and exciting. 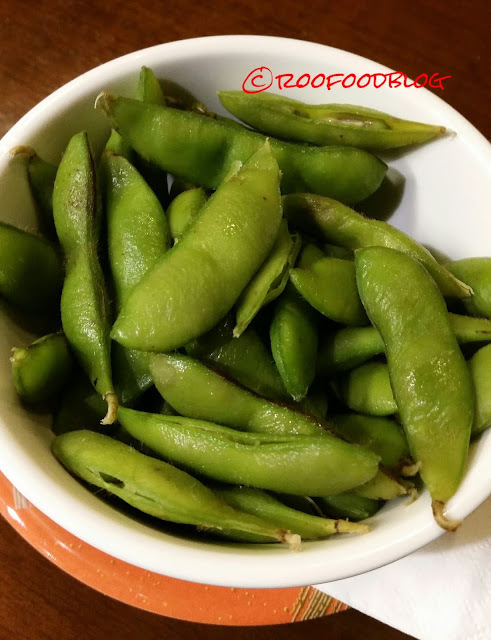 It wasn't until after dinner that we realised the only dish that we actually took from the train was Edamame. These were crispy, cold and good. The remaining dishes were ordered al la carte. I did noticed the selection of sauces on offer. 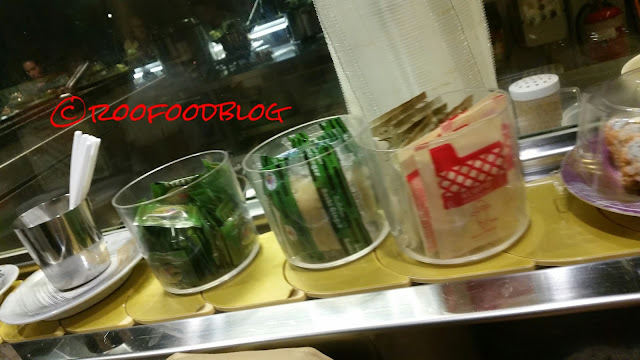 Obviously wasabi was, along with big packets of pickled natural ginger (not pink here) and also packets of teriyaki sauce and kewpie mayonnaise (on the right hand side). Condiments I have never seen elsewhere. I also noted the above average number of packets of ginger my friend was enjoying! It was good. The menu is broken down into types of dishes. 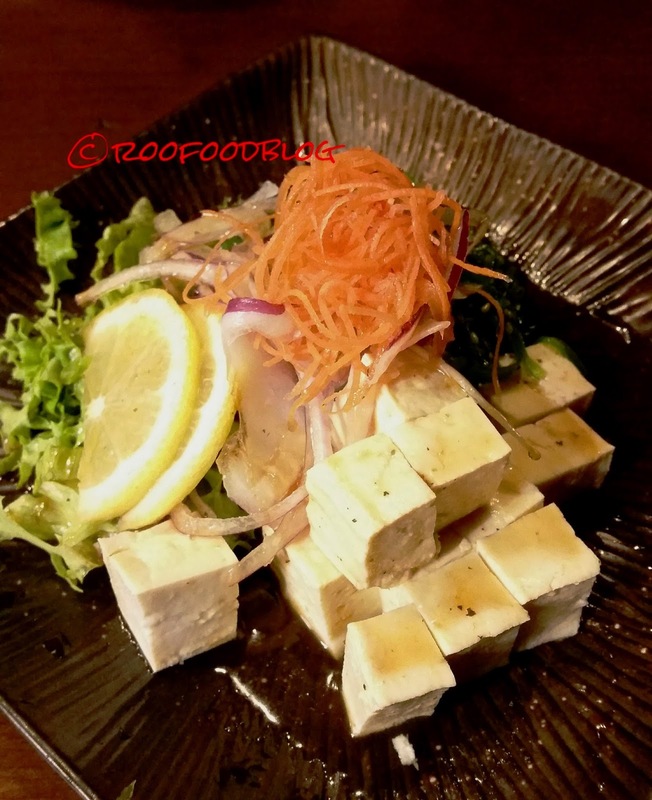 Here we have the Seaweed and Tofu salad with sesame dressing. Firm cubes of tofu next to a big mound of seaweed. I felt healthy eating it plus the sesame dressing was lovely. 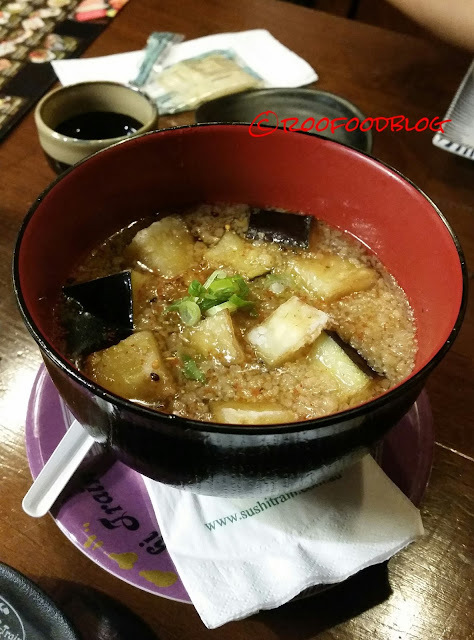 Agedashi Eggplant is a generous bowl. Tender pieces of eggplant are swimming in a light dashi broth. I like it a lot...although my friend would preferred it a little saltier. A selection of nigri follows. There are some delicious options. 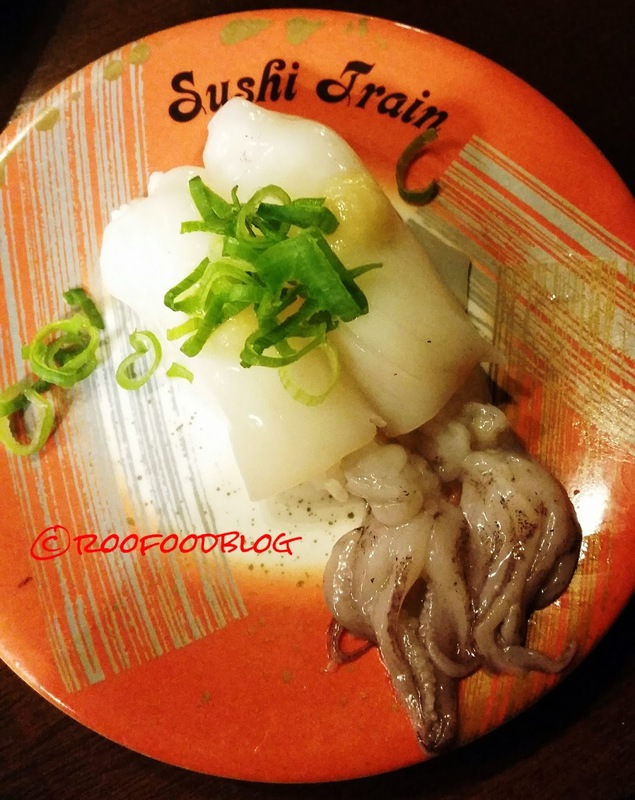 We start we Ika Sugata nigiri which is a raw whole baby squid. This is creamy and tender. 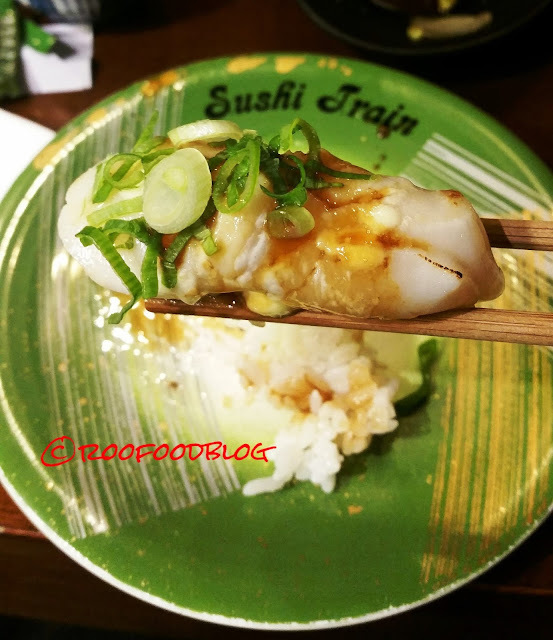 Always a fan of grilled Hotate nigiri, which is more commonly known as grilled scallop. Hotate is my go to nigiri and this one is awesome. Topped with fresh shallots too it's the perfect bite. A salmon volcano ship is next up. This is aburi salmon wrapped around a ball of rice topped with a mixture of cream cheese and mayonnaise and salmon roe. Slightly charred this was delicious! It is the duck nigiri that surprises us. Not your traditional choice of sushi, this duck had a jerky likeness to it. 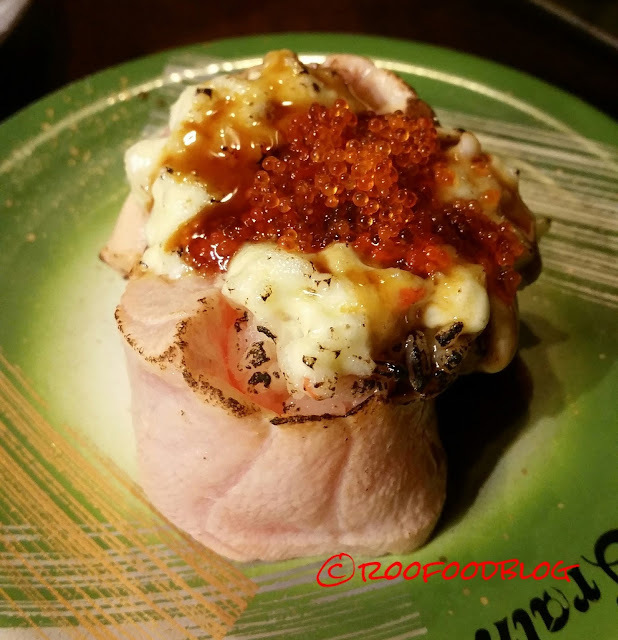 Fatty and delicious with a sweet soy sauce and the mayonnaise. This was a winner! The tiger roll is a huge serve. Ebi tempura (or fried prawn) rolled in sushi rice, nori and topped with avocado, mayonnaise and more tempura crumbs with a miso sauce. 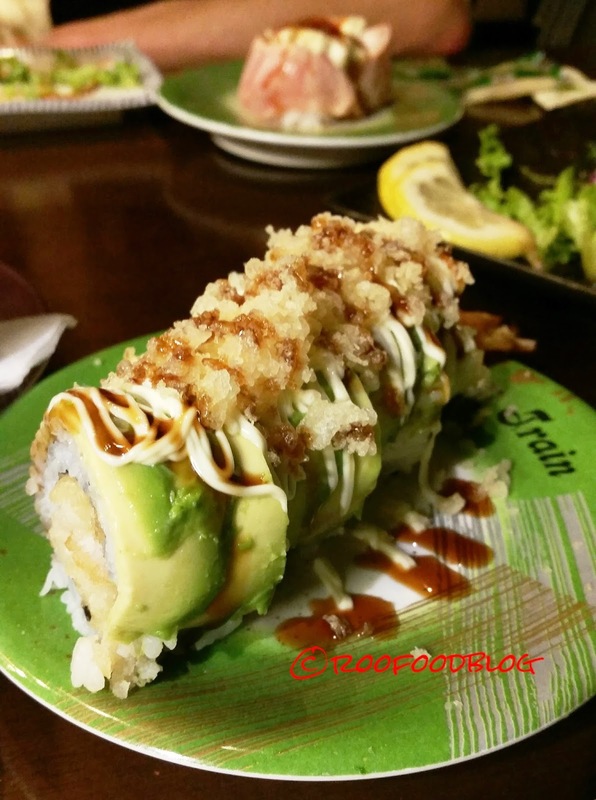 The contrast of crispy fried tempura batter and the creaminess of the avocado was a great texture wrapped around a yummy fried prawn. We end our meal with a tuna nigiri (only because we hadn't had tuna at all this evening and tuna is a benchmark for me). This was melt in your mouth and perfect (but probably should be a starter not an end to the meal). 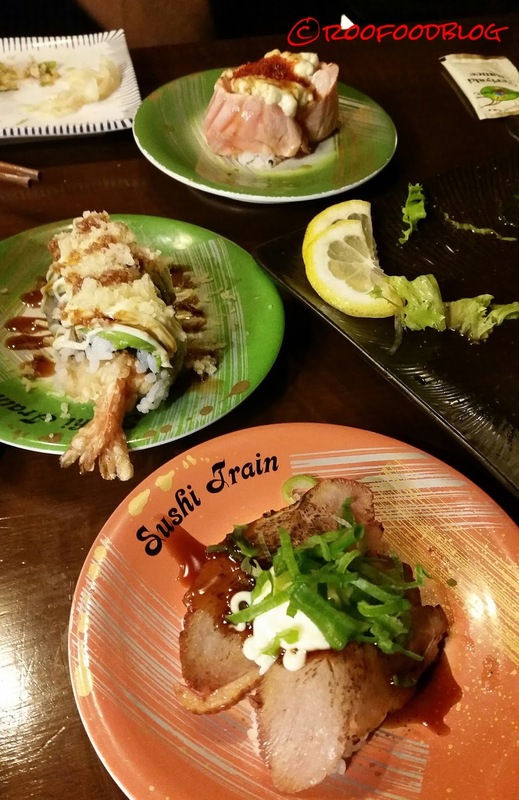 Sushi Train offers a blend of typical, traditional sushi to the more modern dishes and depending on your appetite will fit any budget. 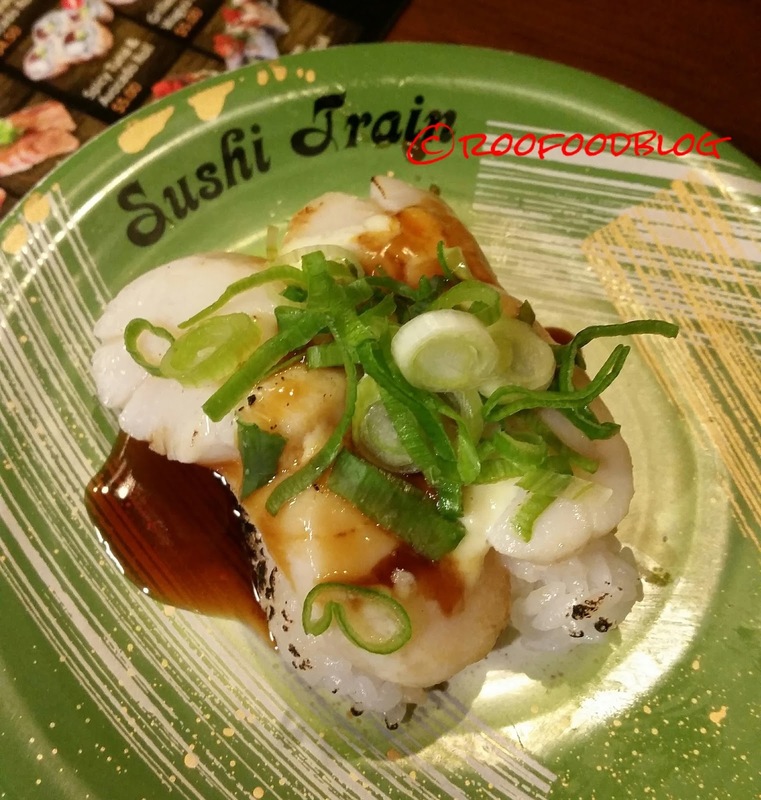 We were overall extremely pleased with out dining experience, as for my friend it was second time ever to do a sushi train and know that I may just have enticed her to go again! Thanks for a great evening. 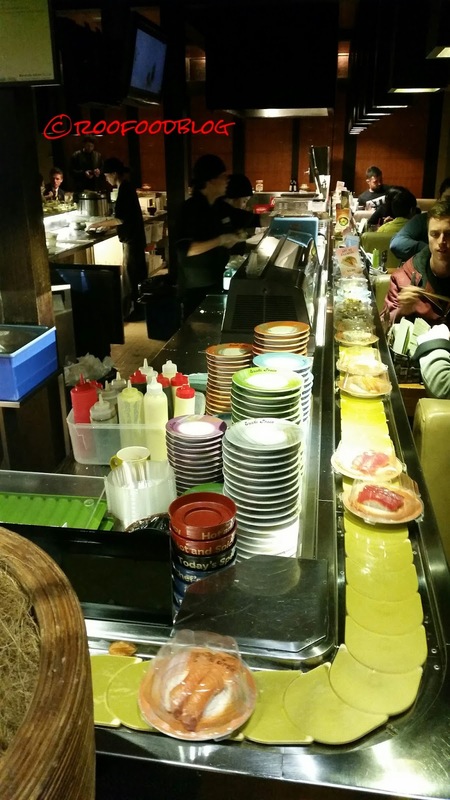 I know I will be returning to a Sushi Train soon! I love that they serve whole raw ika squid here. And aburi scallops are always a winner!